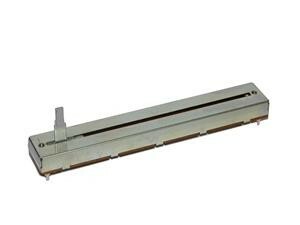 Fits every Technics SL-1200 & SL-1210 MK2, M3D and LTD. This pitchfader has a 'click' at the zero position (original configuration). This is a brand new and improved version of the original Technics spare part (previous articlenumbers: SFDZ122N11 and SFDZ122N11-2). Pitch Fader. Fits every Technics MK5 like the SL-1200MK5 & SL-1210MK5.